This post explains how to perform common operations (like check/uncheck checkboxes by value/text/index, min/max selection limit..etc) on ASP.NET CheckBoxList control using jQuery. 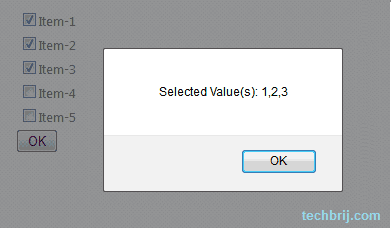 It will display 0 based index of selected items. 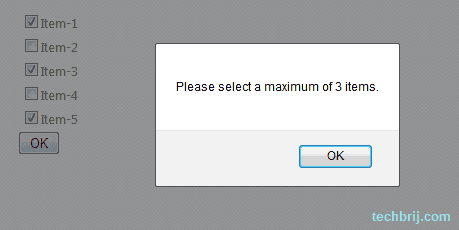 Suppose I select Item-1,Item-3,Item-4 then It’ll give output 0,2,3 in alert boxes. As you’ve seen, Text is placed in label control(next of checkbox) in rendered HTML. So, $(this).next().html() is used to get text. Note: For jQuery 1.6+,use prop and for older version use attr. Suppose you have to check items by the given index. Similarly, you can uncheck items by setting false in prop. In above code, checkbox is selected if value exist in selValue array. In this Label text is compared and if text exists then corresponding checkbox is checked. The above code will select Item-1 and Item-3. Similarly, you can implement Min Selection criteria. Hope, It helps. Feel free to ask related queries here. Very well explained how to use jquery to work with checkbox control. Thanks!!! This is just awesome! Do you know how to add and remove items from a checklistbox?